I opened up my email the other day to a message from a customer that reminded why we take so much care when we pack our parcels. 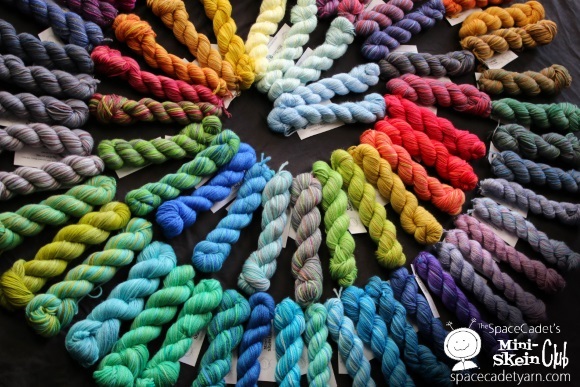 When your box of SpaceCadet yarn leaves our hands, I want it to arrive safely and look wonderful as you open it. 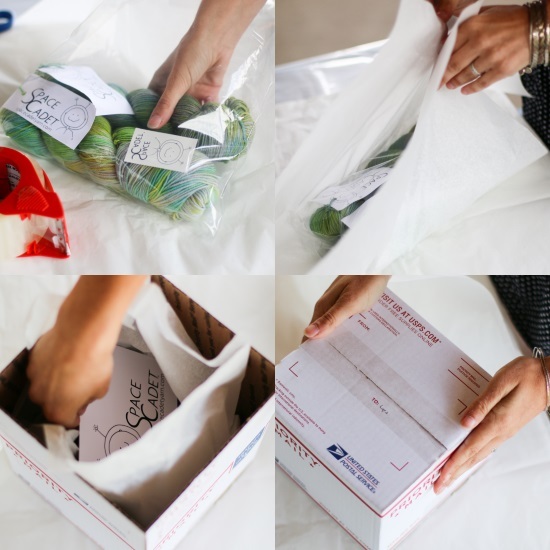 Everything from wrapping it carefully in a protective bag, to the little treats we sometimes include, to the tissue paper lining the box, to using Priority Mail so your parcel can be tracked — it’s all done to make sure your yarn reaches you in perfect condition. 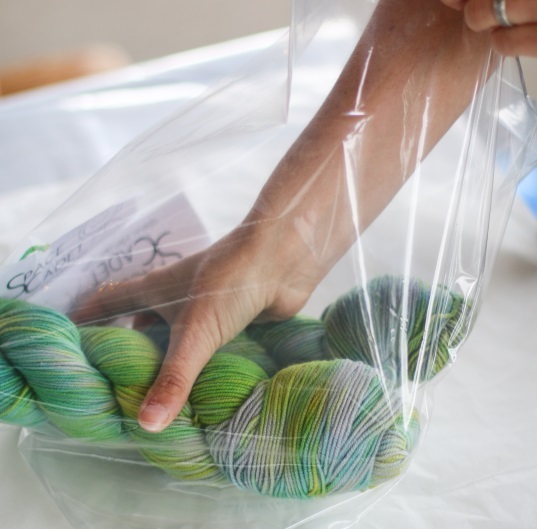 So we start by putting your yarn in a plastic bag. There’s a reason for that which you’ll see in a moment but a big part of it comes from when I was living in England and my postman would leave my parcels on the front doorstep. There they’d sit all day, in the ever-present English drizzle and with no porch to cover them, until I got home from work. It was so disheartening to come home to a soggy parcel but such a relief if the sender had been careful enough to wrap my item in a protective bag! And so, when I started SpaceCadet, I decided to do the same — because I know how important your purchase is to you and I want it to be perfect. We usually include a little treat in your bag as well — just because. Sometimes it’s a button, sometimes a tattoo (as in this parcel), sometimes it’s wool wash. We wrap your yarn in tissue and place it carefully in the box along with a card that tells a little about us, as well as handy links and instructions on how to get in touch. Hi team! Just wanted to say thank you for doing such a thorough job of packing your yarn. This is what the mini-skein box looked like when I received it. When I peeled the plastic off, the cardboard was soaking wet (it was 110 degrees here today…and I live nowhere near the gulf coast…. :)). The yarn survived and was in perfect condition! Whoa! What on earth happened to that parcel?!? It’s so horribly mangled that it’s almost funny but, even though the parcel itself was a near-disaster, knowing that our careful packing meant the yarn arrived in perfect condition just made my day. And we take just as much care with every parcel we send out — because no matter what the outside of the box looks like, I want the yarn inside to be beautiful. And that yarn that Holly was so excited to receive? 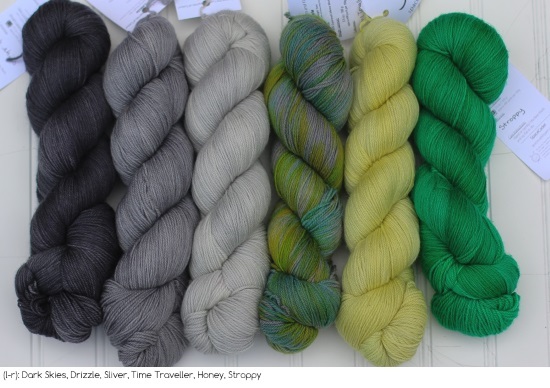 It was her Mini-Skein Club parcel — and it’s no wonder she was looking forward to it! Every month, we dye five brand-new colour-packed skeins for our Multicolour mix and five new fabulously blended colourways for our Ombre & Gradient mix. Opening a new parcel is an mini adventure all on its own! See what I mean? So gorgeous! So, do you wanna to get in on the fun? Click here to find out more!